How to drills to fix (COMING SOON). Human movement principles 9yo Ethan is working on that Khris Davis does well. 2016 avg. Ball Exit Speed = 91.7-mph…2018 avg. Ball Exit Speed = 92.7-mph. Optimized is key! Goldilocks golden rule, not too high, not to low…just right! 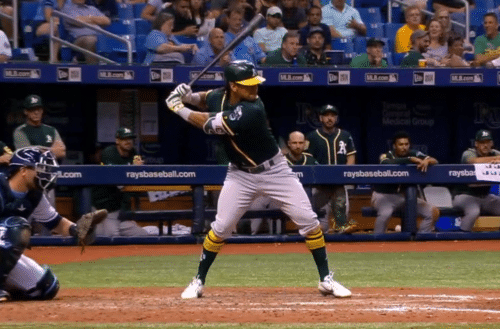 Khris Davis is someone who has been good at hitting despite, as some will say, being poorly built for it – he’s 5-foot, 10-inches, 195-pounds. Compare him to Aaron Judge who’s 6-foot, 7-inches, and 282-pounds. 2018 (w/ A’s): 94-mph middle/middle-slightly in. Getting shorter from start to the turn (camera angle could be slightly different). Another great article. The then/now comparison shows some glaring differences in his swing. Perhaps the most interesting thing is the bat path comments – different for different pitch locations? Maybe, and could be for reasons mentioned in the video. It is very difficult to compare hitters because whatever works for each of them is often different except for the end result. There are certain principles which apply to their success that coaches should look for and find out what works for their hitters. Starting with stride, hips, and hands and watching the head, back knee, and hands at contact point seem rather nb. I want my hitters to finish their swing high over their back shoulder with belt buckle on the pitcher and head on contact point. Showing their numbers or not prior to the swing depends on what works for each hitter. My priority is developing a swing that each of them can trust at each at bat. Things may change as they mature, get stronger etc. Hitting is not all relative. There are common movements shared by all hitters from Babe Ruth to Mookie Betts. These movements are based on human movement principles shared by all rotational athletes. As for hitters, distinguish between their style and their technique. Their styles may make them all look different. Not so with their technique. Couldn’t have said it better myself Joe! Thanks for the support. Coach John! I agree, there’s “bro-science” which indicates works for different hitters, and then there’s human movement principles validated by REAL Science that works for ALL players in baseball/softball or any other sport. I forgot to mention this. He’s not comparing players. He’s comparing Khris Davis to himself – 2015-16 to 2018. Trevor Story 505 Foot Homerun: The Biggest Lies From Hitting Guru #57 Best Hitters Baseball Barrel Path – Do We Have It All Wrong?